Little Red Tree is proud to present "Against Butterflies" by Ann Lauinger, Winner of the Vernice Quebodeaux "Pathways" Poetry Prize. The book also contains 25 full color images taken from the "Mira Calligraphiae Monumenta" by the Renaissance artist Joris Hoefnagel. Richard Harteis Judge of the prize] describes her work: ..".I can only say how much I admire it: It is refreshing today to find a poet who is at once accessible and yet challenges the reader with a unique voice that pays real dividends when you learn to listen. Music, yes, form and symbol and philosophy, yes, but metaphor is the engine which drives it all, the star to which a poet hitches his wagon...." Gerry Lafemina writes: ..".Ann Lauinger's Against Butterflies reminds us of poetry's sheer pleasures.... Lauinger shows us the world through the transformative and transcendental lenses of poetry...and thus asks us to re-experience the world. These poems, with their 'syllabled light, ' are a joy to read, and their world a joy to revel in." 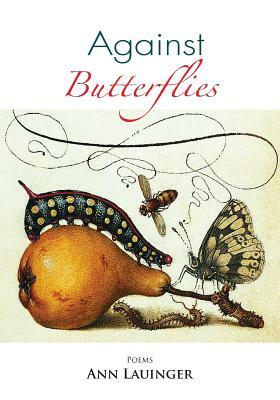 Kim Bridgford writes: "The paradox of Ann Lauinger's title, "Against Butterflies," is that the gorgeous butterflies of her language win out over loss. Although her subject matter is haunting--in fact, her opening sestina makes a literal home for terror--we cannot help accepting her invitation.